Rating: 5.7/10. From 222 votes. In the arena of self-defense handguns, pocket pistols are compromises for those who want to be able to defend themselves but, due to social constraints, must be discreet. The compromises include choice of action type (revolver or semiauto), caliber and, most importantly, weight and thinness (or lack thereof). Fortunately, we have a surfeit of choices today, especially in ultra-light pocket autos chambered for 9mm and .380 ACP. 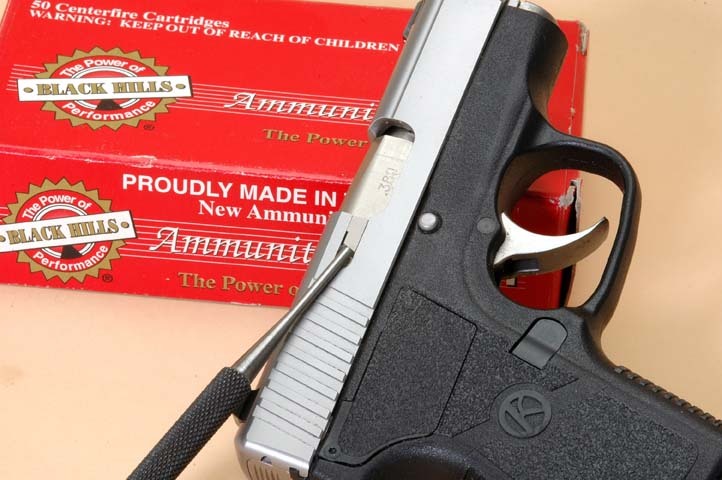 In this article, I review the P380 from Kahr Arms, a semiauto subcompact chambered in .380 ACP. The P380 holds six rounds in its magazine plus one round chambered. It‘s the logical end of what all began with Kahr Arms’ first model, the K9, which morphed into an extensive line of smaller and larger “P” models with steel or polymer frames and chambered in 9mm, .40 SW and .45 ACP. The P380 features a bead-blasted stainless steel slide and a black or pink polymer frame. The standard model features a matte finish on the slide, but the Black Rose Edition sports a polished stainless slide with custom engraving. A California-compliant version (i.e., the model with a loaded-chamber indicator) is also available. The extractor also serves as a loaded-chamber indicator. The P380’s squared, stainless steel slide rides and moves on four steel inserts—two in the top rear of the frame, and two inside the frame’s dust cover. There are two external controls, the slide catch and magazine release, both on the left side of the frame in the conventional positions. Both parts are beveled, as are the other appropriate locations on the gun, eliminating sharp edges. Aligning these very faint tick marks is necessary for disassembly (left), while the slide stop must be aligned with a circular notch in the slide (right). Breaking the P380 down for service is simple. After verifying the gun is unloaded and the magazine is out, line up the two vertical indicator marks—one on the slide and one on the frame. Then, while holding the two marks aligned, press the right side of the slide stop to the left. The slide stop is in tight, and for the first dozen or so times I did this, I needed to use a non-marking hard object to do this pressing. With slide stop removed, I find I need to fully pull and hold the trigger while removing the slide. Next, slightly compress the dual recoil spring and remove it. Then push down on the top of the exposed chamber to drop the barrel down so that it can then be removed to the rear. 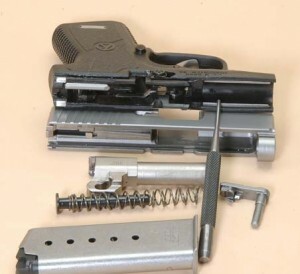 Re-assemble the gun in reverse order, with this cautionary advice: Follow the instruction manual’s directions on how to position and then install the slide stop. If you do it wrong, you might lock up the gun and have to send it back to Kahr Arms to get it apart without damaging anything. The P380 has a single-column steel-body magazine with a removable polymer base plate, which also serves as a finger rest and is easily removed for cleaning. The steel body features four “witness” holes on either side. The polymer follower has a steel insert in its top-left forward corner. This insert bears against and operates the steel slide stop and prevents wear on the follower that would otherwise occur with steel against polymer. 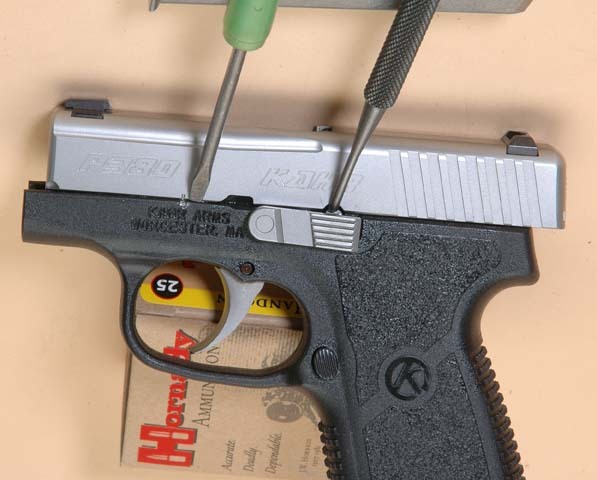 The P380 features the same impressed checkering found on Kahr’s other polymer-frame Kahr Arms pistols on the frame’s front and rear gripping areas, as well as light stippling on the sides of the frame’s gripping area. 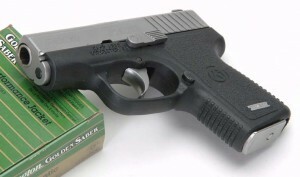 Kahr Arms holds patents on the cocking cam, the striker and the manner in which the trigger attaches to the trigger bar. You can see this when the gun is apart. The feed ramp and barrel underlug have been moved to left of the center line of the bore, which allows the trigger draw bar to lie further inward and flat against the right side of the frame. Also, to improve functioning, the extractor has a hole in its center to further permit any debris build-up to fall away or to be blown out from beneath the extractor claw as the extractor articulates during the firing cycle. The backstrap features impressed checkering. You can see the sights well in this photo, too. The P380 weighs 13.5 oz. loaded with seven rounds of Black Hills 90-grain JHP, exactly the same as my Smith &Wesson Model 642 revolver when loaded with five rounds of Remington 125-grain JHP ammunition. Both guns fit nicely in the front pants pocket of my EOTAC lightweight operator pants in their respective DeSantis Super Fly pocket holsters. In outline, both guns occupy the same space. My sample P380 carried a ramped front sight with a white dot and a square-notched rear sight wearing a vertical white bar beneath the notch. Both sights are dovetailed into the slide for horizontal sight adjustment if necessary. This sample’s sights were regulated such that I shot at or slightly below point-of-aim at 15 yards when using the outline of the front sight. 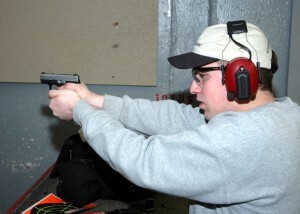 But when I centered and leveled the white dot on the front sight in the rear notch, I made center (point-of-aim) hits. While doing this with a good assortment of ammo, I also established that the P380 functioned with all of it without any malfunctions. The well-shaped trigger guard helps in firing, as does the checkered frontstrap. That said, I did find one quirk: When attempting to chamber a round from a fully-loaded magazine with the slide locked back by depressing the slide stop, the nose of a hollow point stubbed on the barrel feed ramp. A slight bump to the slide was all that was needed to fully chamber the round. Conversely, if I retracted the locked-back slide, this didn’t happen. Also, this problem only occurred with aggressively-designed hollow point bullets; those that more closely mimicked the shape of a JRN bullet, such as Remington and Cor-Bon PowRBall, fed without hesitation. None failed to chamber when the slide was pulled fully to the rear or when shooting multiple rounds. Target results at 20 yards: Five shots under two inches. I first shot Black Hills 90-grain JHP, Speer Gold Dot 90-grain JHP, CorBon 90-grain JHP, Hornady 90-grain Critical Defense FTX, Remington 102-grain JHP and Winchester 95-grain SXT. On later range visits, I shot Federal Premium 90-grain Hydra-Shok JHP, CorBon 70-grain PowRBall and Winchester 85-grain Silvertip HP, along with whatever other old and loose .380s I could find. Doing the last, I finally had the gun not run using some 1970s reloaded ammo topped off with a very aggressive JHP bullet. I also found I very much enjoyed shooting the P380, a reaction I do not have with most of the other new ultra-light .380 and 9mm semiautos. A.J. Stuart hammers out a quick triple. There are some negatives to relying on such a small, lightweight semiauto, though. For one thing, these small handguns are sensitive to how firmly the gun is held. You must hold the frame to ensure the slide’s momentum is fully expended in moving the slide as briskly and as far to the rear as is possible. Another factor: Not everyone can shoot such a small gun. Some simply have hands or fingers too large or too long, so their trigger finger either bumps into the frame, stopping the trigger pull or, when shooting two-handed, their trigger finger runs into the palm of their support hand. Also, with a long finger it’s possible to depress the magazine catch when the trigger is pulled. With large hands, the slide runs into the web of the firing hand, stopping the slide from moving. One-handed firing helps for some, but for others a larger gun is the only answer. All that said, the need or desire for a highly-concealable handgun can well mitigate some of these problems when you simply can’t carry larger gun regularly. While I occasionally do carry my Kel-Tec or Ruger LCP, I only shoot them enough to stay proficient with them. 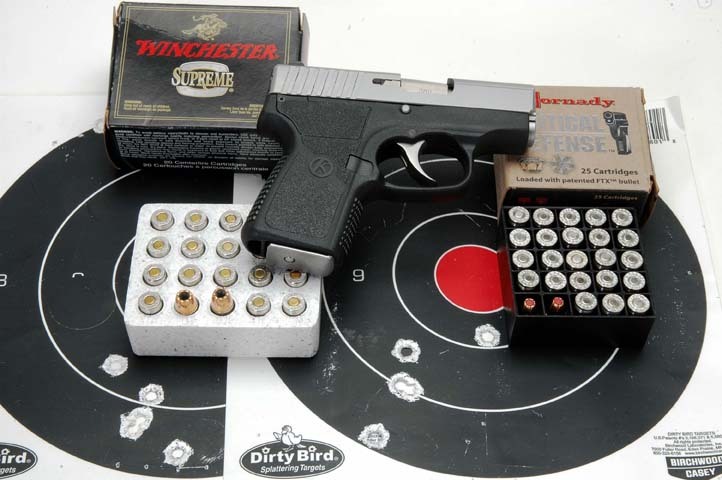 The P380 often goes to the range just for fun. This entry was posted in .380 ACP, $1,001-$1,250, $501-$750, $751-$1,000, Kahr Arms, Semiauto, Subcompact and tagged Handgun Reviews on December 28, 2010 by Walt Rauch. I have the Kahr P380 and have added a Crimson Trace laser. Once I sorted out the ammo the P380 feeds reliably and fully broke the gun in, it has become very reliable. Still, this is not for beginners with poor form and who do not practice. Used right, the P380 is surprisingly reliable and accurate. My carry loads are the higher pressure loads many call +P. Most common for me are Buffalo Bore hollow points. They feed well and have a little more punch. Just remember, if you are not committed to practice and thoroughly break in the P380, you would be better off with a small 38 revolver, such as a J frame Smith and Wesson or similar handguns. 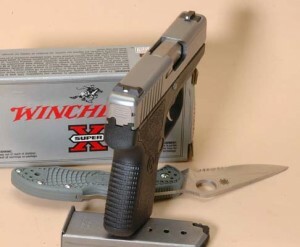 I do not consider a 380 a first line defense handgun, based on the experience of others. I think a 38 SPL +P J frame revolver would be a better choice in most cases and is more reliable in the hands of a nervous person. Things change a lot when one is being attacked. I get nervous when I know there are people who mean to do harm. I expect others will be the same, so keep it simple and practice. Also, get some formal training and regular refreshers. Great quality and accurate, but a large number have frame and jamming problems. Kahr will pay shipping both ways, but it may take 3 or 4 tries to fix them. This is too bad because this is such a wonderful gun. But the problem is not fixed and is very common. When you pay this much for a gun, you expect to feel like you have bought a new gun, not one that has had it’s parts swopped out many times. If you like a 380, wait for S&W to get rid of the laser and get the Bodyguard 380 or go for the Kahr PM9 in 9mm. I have the P380 for CCW and love the way it disappears in my pockets. It is a high quality piece with surprisingly benign recoil, even with SD rounds. I did follow the 200 round break in period recommended by Kahr, and the only FTF issues I had was with some of the cheaper JHP rounds. My normal carry ammo is Hornady CD, and I have had zero issues with feeding or ejecting. It cost more than some of the other .380s, but how much is your life worth if you eve have to use it in self defense? I did add crimson trace laser guard after firing a few hundred rounds. The sights are not large, and my eyesight isn’t what it once was. The laser makes use of the fixed sights unnecessary. Highly recommended. After buying and reselling a few other .380’s that proved unreliable I hit jackpot with this classy little .380! This little pistol is accurate in my hands and is easy to carry. I have a P380 and like it a lot. I haven’t shot mine much, but so far it’s worked fine. I like to slip it into my pocket, unholstered, so I use a trigger block to keep it safe. I do the same with my PM9. I have had my P380 for over a year. During the first 200 rounds, break in with cheap ammo, I had several FTF problems. Since then with better ammo, no failures. It is my EDC, 24/7, in. Uncle George wallet holster. In a word it is Perfect for me, small, reliable, and dependable. Some draw backs, for a women it has a very strong return spring, and not allot of area to grip, on the plus side it is good for a person with small hands. I recently purchased a new PT380 KAHR. Out of the box it malfunctioned on every magazine I fired, 100 rounds. The subsequent 100 rounds produced multiple malefactions after cleaning and lubrication. The polymer lower receiver has nicks and hard dug-in lines from the upper receiver. We’ll see how it works after shaving out the polymer threads and a ton of oil. Nice gun but it is not reliable at this point. Not for a small carry gun that needs to work when you need it. Very accurate and soft shooting weapon. The 200 round break-in is pretty standard for Kahr pistols, everything is very tight on the gun. It does not like “white box” ammo from Winchester FMJ (blunt nose) and absolutely hates Lehigh Defense 68 gr maximum expansion. That is a shame because the Lehigh is a very effective round. The Kahr will consistently malfunction if the lead bullet is a Lehigh…works just fine if the first one out of the magazine a round nose followed by Lehigh. I use a Uncle Mike’s pocket holster and the Kahr just disappears in my pocket, Great concealed carry weapon. I’ve had good luck with Grizzly 70 grain copper (its $41 a box!) but only one of my three will shoot the regular Grizzly lead jacketed H.P. Anyhow, you get the idea – try different ammo! As for the gun itself it is very well made, and shoots quite softly. My Bersa 380 is less pleasant to shoot. Fairly accurate at 7 yards or so and you can shoot it faster than you would think. If you are willing to invest the time to master it and to buy lots of different pricey ammo – this is a great pocket pistol! I couldn’t be happier with mine. It fits my hands and thus shoots very accurate. It has not malfunctioned since I got it. Tula, Winchester (ball), hornaday , Federal. Can’t get it to malfunction. Carry discreet everywhere, church, Christmas gift exchange, partys , or getting the mail. No one knows it is there. I chose Fiochhi extremas for protection due to testing I thought was legitimate. Just a great carry gun. Best I’ve found. Maybe I just got a good one but best of a dozen or so I’ve tried. After about 500 rounds, and finding what would ALWAYS work I have come to love my P380. I think the ARX round will always work for everyone’s P380. Other than that round, what works for me (all the Winchesters) might not work for you. Probably the best summer, in the pocket carry gun around. With an IWB holster you don’t even know you’re carrying it though it can lost in your waist when drawing. An incredibly accurate .380. Up to 15 yards I always shoot center mass or lower torso at 2 second intervals (all my range will allow) and might miss once in 20-30 rounds. I have one mag out of six which won’t lock back on last round, have never figured it out despite part changes, so don’t carry it. Easy to take down and clean. And there is a technique which makes reinstalling the recall spring assembly easier. In my opinion, for summer carry this is the best pistol on the market albeit not cheap. I have the all black with night sights which is top of the line price wise. Only wish I had gotten night sights on my PM9 which would fire a rock if you placed it in the chamber. I just purchased a used P380 and found that it will not work unless the clip is in? I also cannot break it down for cleaning any farther than removing the hold open latch. Is this common?